Have you ever wished your bedroom felt cozier? Are you surrounded by a solid, cold bed frame that’s not very inviting? If so, the Brentmore Charcoal Fabric Bed from American Freight Furniture and Mattress might be a great upgrade for you. The Brentmore bed is the stylish and affordable upholstered bed you’ve been dreaming of. The entire bed frame includes a headboard and footboard. It features a charcoal fabric with shiny silver nailhead trim detailing. 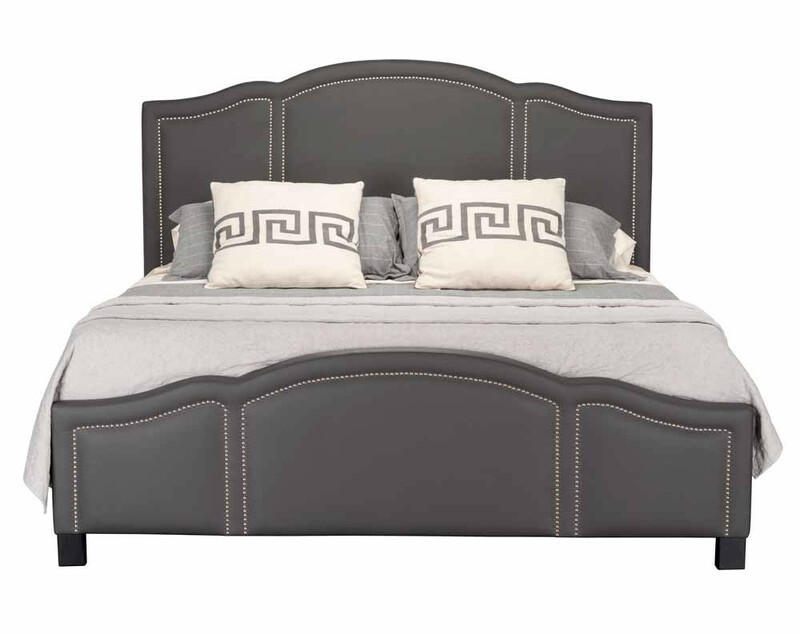 The symmetrical piece features curved arches on the headboard and footboard. 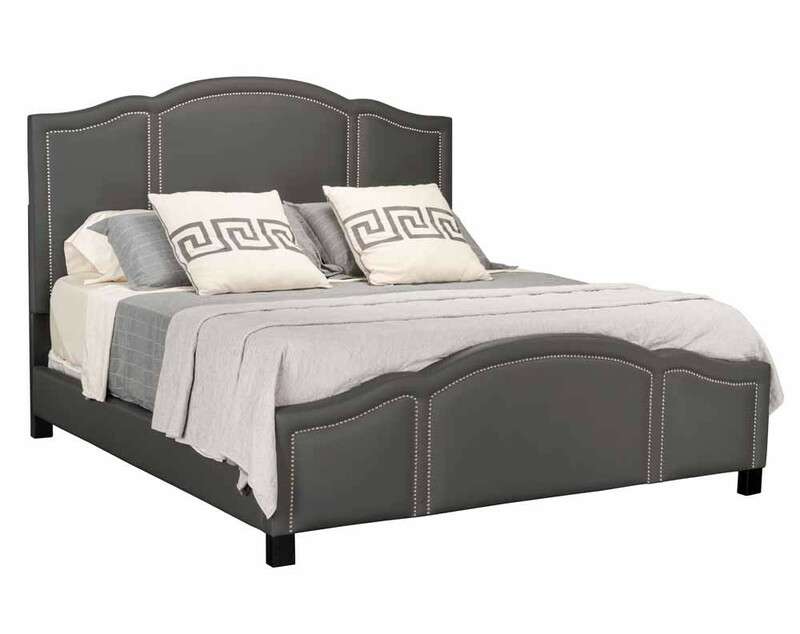 The nailhead trim perfectly outlines the center arch and matching sides at the head and foot of the bed. The frame rests on black square legs that sit just a few inches above the ground. It’s available for Queen and King beds. The neutral gray is easy to pair with your bedroom theme. You can take it home today for only $299. There are a variety of bedroom sets at American Freight that will match the frame perfectly. Browse our selection of bedroom furniture here. You can buy pieces individually to incorporate into your bedroom design. Choose a dresser and mirror and an accent chair to add storage and luxurious comfort to your space. The center of attention in your bedroom is your bed! Draw everyone’s eye to the plush and comfortable Brentmore Charcoal Fabric Bed Frame. You’ll love how soft the polyester blend fabric is. Imagine yourself sitting up in bed to read or watch your favorite TV show. But don’t take our word for it! You can see the Brentmore for yourself at your local American Freight Furniture and Mattress. We keep tons of inventory in stock for you to try before you buy. Get up close to the Brentmore bed frame to see the nailhead trim detailing and touch the soft polyester fabric. Plus, seeing it in person will help you feel more confident in your purchase. For only $299, you can make the Brentmore Charcoal Fabric Bed Frame your very own. Stop by American Freight Furniture and Mattress to place your order today. While you’re there, ask about our payment plans. You could take home the Brentmore for just $50. There’s also free layaway and same-day delivery for all in-stock items. Make the easy choice and shop for all your bedroom needs at American Freight. Click here to find a store near you.